Welcome to the AutographsForSale.com blog! Welcome to the blog of AutographsForSale.com,�written by owner Theo Chen. My goal is to inform you about my world of buying, obtaining and selling autographs. Those who know me already know I hold strong opinions about the autograph business, and I've never been shy about voicing them. I'm not going to hold back here.�But this post is the history of AutographsForSale.com. 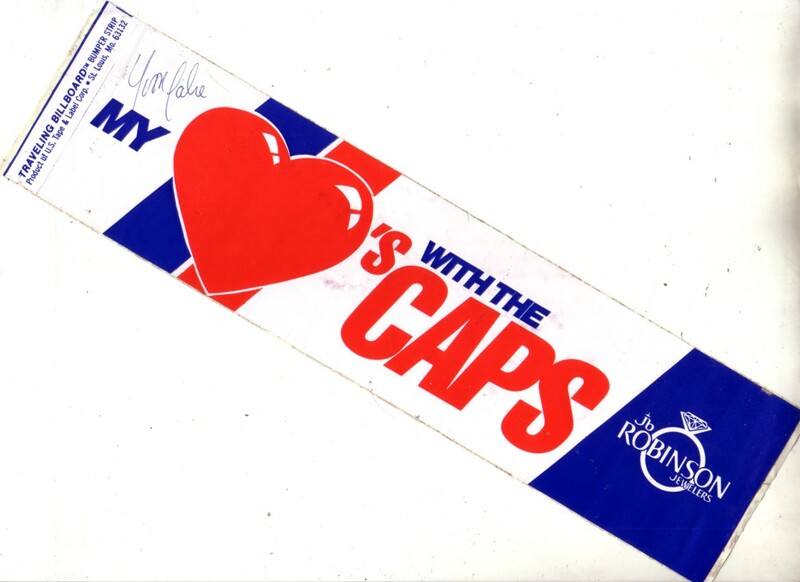 I got my first autograph as an 8 year old kid, from a Washington Capitals hockey player named Yvon Labre at the neighborhood mall where I grew up in Maryland. (Yes, I still have it! See below.) Little did I know then that autographs would become my livelihood decades later. But first I detoured into cards. I got my first baseball cards the same year I met Labre (1974). As a teen I forgot about cards, but they recaptured my attention in college and never let go. I became an active collector and started setting up tables selling at card shows. I started writing for Baseball Hobby News. These articles caught the attention of Dr. James Beckett and before I knew it, I was driving to Dallas in 1988 to intern at Beckett Publications. I started working full time for Beckett in 1989. I worked on the editorial side and the price guide side, sometimes both. In my free time I developed a passion for collecting autographs, and began writing autograph articles for Beckett. I started selling my extra autographs on eBay in 1997. In 1998 I left Beckett to work as Autographed Product Manager for Upper Deck Authenticated. I only worked a year at UDA, but I got a thrill developing new autographed products for�Wayne Gretzky, Ken Griffey Jr. and Michael Jordan (links are to UDA products I designed and have for sale on AutographsForSale.com).�I learned much about the industry and made great contacts. In early 1999 I started looking for a better way to sell autographs. I searched for domain names, and was pleasantly surprised to find�AutographsForSale.com available. I grabbed it, though I had no idea what I'd do with it. A�few months later, with the dot-com boom in full swing, I felt the itch to be my own boss. I had plenty of autographs to sell, I'd been collecting for a decade. I quit UDA and worked 4 days a week for Fotoball while building�AutographsForSale.com. I received my first order on Nov. 24, 1999. A couple months later, I quit Fotoball to focus on AutographsForSale.com full time. 11+ years and 9,000+ orders later, AutographsForSale.com is still owned and operated by me. My goal for AutographsForSale.com was never to make me rich, just to comfortably support me and allow me to work when I want, and not work on the rare days when I don't feel like it. It's done that.�Over the years I've developed a network of companies and people that work with me, but I've never hired anyone and don't plan to. Managing people isn't something I enjoy. I think customers appreciate knowing there's a real person -- someone who's spent most of his adult life working with autographs -- behind this website. Hopefully my blog will strengthen this connection.